Wow this would definitely make a good start for my day, a wonderful delicious breakfast recipe! Lucky H! So have you found that ciabatta bread works best for not getting mushy and getting crispy when fried? Yes, but only if it’s fresh. I also tried a fresh loaf of a sweet potato pecan loaf that my local bakery makes and it worked well also. It’s really a textural thing in that the bread has to be soft but sturdy. Yes! Yes! Yes! 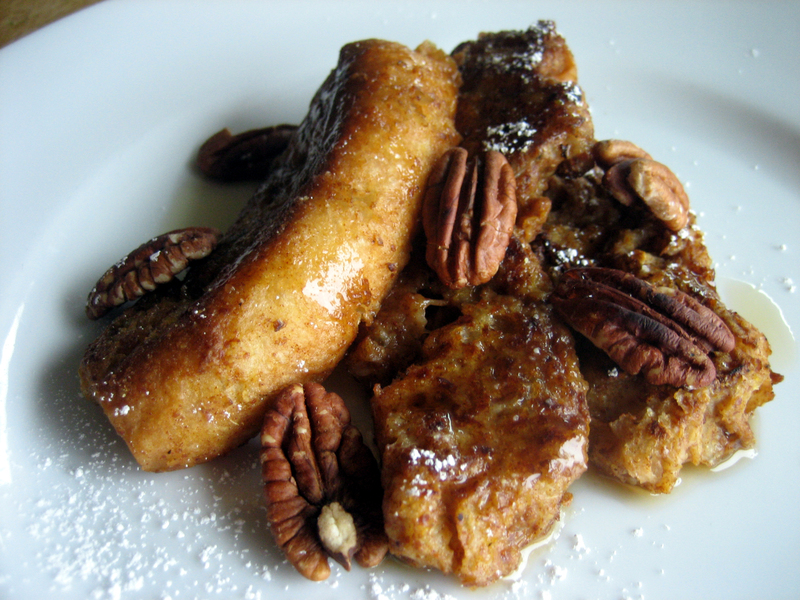 I love French Toast, but haven’t found a really good recipe since going vegan. This one uses my favorite So Delicious coconut milk and pumpkin, and looks and sounds fantastic! I can’t wait to try it. Thank you! Right on, Ginger. So Delicious is my favorite milk as well. The french toast sounds fab. One question. Recipe refers to using a non-stick skillet. I’ve always been afraid of non-stick skillet surfaces. Is there a type you recommend that is safe? Thanks so much. I share your concern with non-stick pots and pans and I do not use them often. Another way you can cook this is to turn your oven to 400 degrees and place a Silpat-lined [Silpats are *wonderful* reusable silicone baking sheets that you will fall in love with] baking sheet in the oven to preheat along with the appliance. Then after dipping the toast, you place it onto the hot baking sheet and slide it back into the oven to cook until the top is set. Flip the toast over and repeat for the other side. The reason you do this is because otherwise the underside will get mushy . I tend to use the oven method more because I try and avoid using cooking fats and such whenever possible and I’ve made similar recipes, that I have yet to post, making savory baked toasts. I know that I didn’t answer your question regarding safe nonstick cookware, but I don’t believe that there is such a creature so I also tend to avoid using it whenever possible. I hope this helped. Thanks very much. That gives me the info I need – and answers the question too.